Shuang Shuying (双淑英) is a 76-year old evictions petitioner, religious rights activist, and outspoken opponent of the Reeducation-Through-Labor (RTL) system. She saw her Beijing home demolished in 2002 to make way for Olympics redevelopment. After the demolition, her family had to relocate eight times. She has been imprisoned since February 2007 on trumped-up charges after appealing for her son's release. When she began her prison term, Shuang was suffering from high blood pressure, diabetes, and a heart condition. The authorities have denied her family's request for medical parole, and her health continues to deteriorate. Shuang Shuying and her family are longtime rights activists. She and her husband, Hua Zaichen (华再臣), 88, have participated in demonstrations against the RTL system, and Shuang's son Hua Huiqi (华惠棋), a "house church" pastor, is a vocal religious rights activist. On January 26, 2007, Shuang and her son Hua Huiqi were beaten and detained by the police when they tried to petition the National People's Congress for compensation for their destroyed home. Shuang was released the same day, but her son remained in detention for "obstructing official business." On February 9, 2007, when Shuang and her husband went to the Chongwen district government office to protest their son's detention, a police car drove toward Shuang. Fearing the car would hit her, Shuang hit it with her cane. In late February 2007, Shuang was tried and convicted for "intentional damage of public and private property" and sentenced to two years in prison. Shuang's family was permitted few visits to her. The authorities have used visits to Shuang as a bargaining chip with her family: in July 2007, when Shuang's son was released from detention, an officer from the Public Security Bureau told him that if he agreed to provide information on other Christian house church practitioners and petitioners, a visit with his mother could be arranged, and that if he did not cooperate, he would not see his mother again. Shuang was held at the Beijing Public Security Bureau Chongwen Division Detention Center for the first six months of her sentence and then transferred to Beijing Women's Prison, where she is currently the oldest inmate. Shuang was beaten severely while in prison. She suffers from diabetes, high blood pressure, cataracts, heart disease, and arthritis, and requires daily medication. In August 2007, Shuang's family's request for her release on medical parole was denied. In 2008, family visits are permitted once a month. Shuang's husband, Hua Zaichen, reported in a July 28, 2008 letter to Human Rights in China that Shuang is "almost completely blind in both eyes due to the abuse that she endured." The United States, European Union and United Kingdom have called for Shuang's immediate release from prison. United States: The U.S. Department of State highlighted Shuang Shuying's case in the 2007 Report on International Religious Freedom. During their June 28, 2008 meeting with Li Zhaoxing, former Foreign Minister and Ambassador to the U.S., and current Chairman of Foreign Affairs Committee of the National People's Congress, Congressmen Christopher Smith and Frank Wolf presented a list of 734 political and religious prisoners, that included Shuang Shuying to demand their immediate release. European Union: Shuang Shuying's case was raised at the May 2007 round of the EU-China Human Rights Dialogue. United Kingdom: On October 9, 2007 Mike Hancock, Member of Parliament, appealed to the Secretary of State for Foreign and Common Wealth Affairs to urge China to unconditionally release Shuang Shuying and Hua Huiqi. Shuang Shuying and her family have suffered a range of government abuses for more than half a century. In 1950, Shuang's father was executed before her eyes after being labeled a "counterrevolutionary." In 1956, Shuang's husband, Hua Zaichen, was also branded a "counterrevolutionary" and condemned to more than twenty years of Reeducation-Through-Labor. During that time, Shuang was urged to divorce her husband and, when she refused, was harassed by the authorities and her work unit. Her children were bullied by their teachers and schoolmates. Since his release, Hua Zaichen and Shuang have been committed to speaking out against the RTL system and, in 2001, staged a protest in Tiananmen Square. Shuang's son, Hua Huiqi, converted to Christianity in 1990 and has since been a leading figure in Beijing's Christian house church movement. Shuang herself converted soon afterwards. Over the past few years, the whole family has been put under tight surveillance and subjected to repeated harassment and abuse for its protest activities. On February 9, 2007, after hitting the police car in self defense at the Chongwen District Bureau of Letters and Visits, Shuang was immediately dragged into the Bureau's reception room by police officers; she was formally arrested that same day for intentional damage to property and was put on trial on February 26, 2007. Shuang was sentenced to two years in prison and her appeal was denied in April that year. 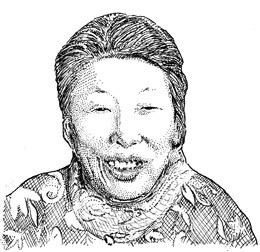 Shuang's family continues to be tormented during her imprisonment, as Shuang's husband told Human Rights in China in his July 28, 2008 letter. As China prepares to host the Olympic games, I've reached the age of 90, and my 78-year-old wife, Shuang Shuying, has been sentenced to jail. She is the oldest inmate at Beijing Women's Prison. She is almost completely blind in both eyes due to the abuse that she has endured. Throughout her life she has suffered extensively at the hands of the CPC because of me, her husband, Hua Zaichen. Her life up to now has been one of vagrant wandering, with no place to call home. I turned 90 this year. I've witnessed the great transformation China has undergone over this past century. My wife Shuang Shuying and I together have experienced 59 years of political hardship under the CPC regime. In 1956, I was deemed a "counterrevolutionary" and held in custody for a full twenty years. During this difficult time, it was my wife who gave me courage and raised our four children on her own. Shuang Shuying and our son Hua Huiqi are Christians and members of a house church, which is not tolerated by the CPC regime. In 2002, the government tore down our home; not only did we not receive any compensation, but we were also not allowed to rent an apartment. In February 2007, Shuang Shuying was arrested and sentenced to two years in prison. In October 2007, our simple home also became a prison as a lock was welded onto the outside of our door and our electricity and water were cut off. Six policemen sat in our home and forbade us to leave. Hua Huiqi was beaten so badly that he had to be hospitalized. On July 2, 2008, the police again forced our door open with an 18 pound iron hammer. Hua Huiqi's wife Wei Jumei and my elder son Hua Huilin were badly beaten. We were tossed into the street. I lay on the ground, wet with rain from that evening, huddled in my quilt. I waited for dawn, hoping that China's dawn would come more quickly. My time left here is not long. I wish only to see my wife Shuang Shuying one last time. I want only to understand one thing: is it really a crime in China to welcome Christians into your home? Our human rights situation is worsening here in Beijing, during China's so-called "Human Rights Olympics." We hope that the international community will pay attention to China's human rights situation. Below is a listing of HRIC's advocacy and media work on Shuang Shuying, including press release, statements, and case updates. To subscribe to HRIC's press list, please e-mail communications@hrichina.org with "SUBSCRIBE" as the subject heading. The Human Rights in China (HRIC) Daily News Brief is a daily compilation of selected human rights-related news covered in local and regional Chinese and English press compiled by HRIC's research office. Visit the Daily News Brief for recent news articles on Shuang Shuying. "China: Partial List of Political Prisoners Detained or Imprisoned as of June 26, 2008 (734 cases)," Congressional-Executive Commission on China, June 26, 2008, http://www.cecc.gov/pages/victims/20080626_CECC%20PPD_DET_734%20rec.pdf. U.S. Department of State, 2007 Report on International Religious Freedom (Washington, D.C.: U.S. Department of State, 2007), http://www.state.gov/g/drl/rls/irf/2007/. "Smith in China on Major Human Rights Appeal in Run-up to Olympics," Chris Smith, July 1, 2008, http://chrissmith.house.gov/News/DocumentSingle.aspx?DocumentID=96117. Hua uses the Chinese calculation for age in his letter.